With a sheen to capture all types of lighting, our Lamours fit any event. Available in matching napkins and chair coverings, each celebration will be unique to the luster found with this fabric. Like the metal that is a conductor to electricity, the warm reddish-brown Copper will add that spark to your celebration. 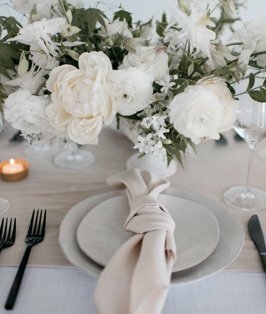 The essence of purity and simplicity, White is not the lack of color, but the quintessential color that the hallmark for any wedding or affair. Also, with tablecloth sizes unparalleled in our industry, you will find the ideal size in the perfect hue.